(04 March 2017) – The Centre for Alternative Technology (CAT) has produced a new report. ‘Zero Carbon Britain: Making it Happen’ offers a ‘toolbox’ of ideas that can help inspire, inform and enable us to make change happen. 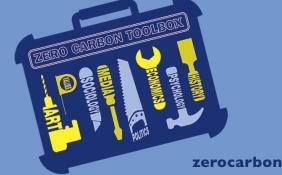 The CAT’s latest research report, ‘Zero Carbon Britain: Making it Happen’, explores the economic, cultural and psychological barriers to achieving net zero greenhouse gas emissions, and sets out the positive, connected approach we need to overcome them – joining up research and practice across disciplines, borders, sectors and scales. Working within an interdisciplinary framework, the report brings together thinking from researchers working in psychology, sociology, political science, economics and other social sciences, as well as faith and spiritual practice, arts and culture. Drawing on a wide range of peer-reviewed journals, books, reports and articles, as well as stories from real-life projects, it explores ways that we can overcome barriers in innovative ways.